Great game. Bumgarner made it a taut chess match til the late innings, and Pablo Sandoval took advantage of J.J. Putz. The Giants five game losing streak ended with Matt Cain on the mound in Arizona, but sadly, The Big Horse got tagged for three home runs and gave up four runs and so has yet to earn his first win of the season. Nick Noonan continues to show poise and ability at the plate. He pinch-hit lead off in the 8th and got aboard before two walks loaded the bases for Brandon Belt’s game-winning two-run single to bring him home. Belt also homered in the 2nd inning when the Giants got to their longtime nemesis Ian Kennedy, scoring three runs off him in the first two innings. The Giants got another outstanding inning from Jean Machi in relief, who ended up getting his first win of the season. Sergio Romo picked up his 9th save. We agree … it’s early! all of which were for nought as we could do nothing to get a runner across the plate. Our one run in the game came off a single by Pagan, a stolen base, a hit and a Wild Pitch! This one was winnable. I was hoping to sweep these guys … and sadly … we just couldn’t get it done. nice to see Kraig – he’s my kind of Giant fan. Check out his cool camera mount/stabilizer … at iVideoStick.com. Let’s Go Giants! Rough Up Kennedy! Beat The Snakes! Tonight Ryan Vogelsong got touched for two home runs that put the Giants behind twice and twice the Giants responded with just enough runs. The second time, the Giants tied the game on a two-run homer by Posey in the 8th. Then, they won it in the bottom of the 9th on a Brandon Belt walk-off base hit. Victory felt inevitable. It was almost as though the game was following the Giants’ plan and the Diamondbacks only thought they were in the drivers seat. It’s a direct response by the team in the other dugout to react to the Giants pitching-powered, defensively-oriented play. Often teams play – or at least try to play – to the Giants level of defense for five or six innings. Notice how many pitchers have their best games against the Giants? This results in copycat innings and tight ballgames and last night was a great example. But it’s chess – the opening and the midgame may have very little to do with the endgame. The Giants are playing white and starting first, their opponents are playing black and playing keep-up. They try to play our game as long as they can while we plow forward playing our game for 27 outs: just enough hits, just enough runs; keeping the score low on defense and looking for the chink in their armor – usually it’s the pen. This requires us to stick to the game plan and execute while looking for the mistake we’ll take advantage of. Tonight, it came together ideally. This morning Brandon Belt woke up having received tremendous criticism for his lack of hitting, and found himself benched, replaced once again at first base by Joaquin Arias. Before the game Belt was asked to take special batting practice, attended by Bruce Bochy, who actively engaged in coaching him. This made press. Down 4 – 2 in the 8th and with Scutaro on first, Buster Posey blasted a home run to dead center, the deepest part of the park, to tie it up. The newest member of the Giants’ bullpen Jean Machi started the 9th, then passed it off to Jose Mijares who handed it to Sergio Romo for the last out to prevent the Snakes from scoring again. Then, as though Bochy had drawn it up, Andres Torres lead off the 9th with a first pitch single, Brandon Crawford advanced him on a perfect bunt, and Bochy put Belt in with a double switch – which put him in the batter’s box with a chance to win the game. Belt’s one-out, game-winning, walk-off base hit was an epic smile-bringer. Sergio Romo pitched one ball in the ninth and got the last D’back out. With that one pitch, thanks to Brandon Belt, he also got the win, his first of the season. A great game for the Giants and a special night for Buster Posey and Brandon Belt. The Padres were preyed upon by the Giants, who were licking their wounds after being swept in Milwaukee in games which exploded the ERAs of Barry Zito and Matt Cain. So the Giants relished the opportunity to face a weak opponent back at home in the friendly, wide-open spaces of AT&T – they were eager to do what they do so well they’re the World Series Champs. The formula is clear: pitching, defense, just enough hits and taking advantage of opponents’ mistakes. We should stop calling Giants Baseball “Torture,” because it’s the Giants’ method that creates the tension. They want to set the conditions taut and then to play crisp, so the other team will make a mistake first. 1. Pitching – quality starters and a stable pen. The Giants rely heavily on starting pitching and on the bullpen. Bochy continues to improve at making the necessary moves to prevent runs from crossing the plate. 3. Just Enough Hits – situational hits to produce “just enough” runs. It’s a different philosophy … think Just Enough Hits as opposed to Murderer’s Rows. We keep mowing down Murderer’s Rows in the World Series. Pitching wins out over a month of postseason play. All you need is just enough hits. Some may think of plays that result from opponents errors as lucky, but when you play tight, crisp, team ball like this, you create conditions by which to seize upon errors of the opponent. It’s a plan that’s going to generally result in close games. Lurie: 14 of 19 games have been decided by less than 3 runs and the Giants are 10-4 in those games.” We’ll take that! So quit chewing your nails and get used to it. Learn to enjoy the chess match from the defensive perspective, let’s talk pen vs. pen. The highlight of the weekend was Angel Pagan’s walkoff double on Friday night. Though the Giants had to come from behind and score late to win it, the score was low because the pitchers were doing their thing. Giants starting pitchers gave up two runs over 27 innings and had two shutouts. Bumgarner got tagged by Chase Headley for those runs, which was an anomaly in his pitching. Otherwise he was on target and the team didn’t let him get the loss: Pagan’s walk-off prevented it. Tim Lincecum’s performance was dominant – with eight strikeouts over 6 innings – and the Giants’ system worked most efficiently in Game Two. Pablo Sandoval’s two run homer was all the scoring we needed and all we got. Mijares, Casilla and Romo cleaned up, held and closed. In Game Three, Bruce Bochy left Barry Zito in through the 7th, which, if it were Bumgarner or Cain I would consider exactly the wrong move (please see other posts) … but Zeets is a special case, pitching perhaps the best of his life. He wants and deserves the innings. He was, to borrow Marty Lurie’s word for it, “electrifying” – seven shutout innings on 102 pitches with 71 strikes and pitched a great game. Chad Gaudin came in with a five run lead and in a non-save situation maintained the shutout for the final two innings. The bullpen is really starting to gel. Pablo Sandoval and Buster Posey each had a two-run homer in the series: Buster’s first home run of the year and Panda’s game two decider. The Giants have hit 11 Home runs, and I believe that’s 3rd worst in the Major Leagues – Just Enough Hits as opposed to Murderer’s Rows. In the absence of power, key hits are what’s important and several guys on the team are doing the job to create a collective effort – a different hero every night. Angel Pagan won Game One with that walk-off double but has been getting other key hits throughout the young season. Last year he tied the 109-year-old Giants record for home hit streak and he seems focused on breaking it this year. He and Andres Torres have been picking up the pace to get on base as Marco Scutaro starts to find his stride. Hunter Pence has been getting key hits as well and has four home runs to lead all Giants. Brandon Crawford is having his best year hitting in the majors thus far, threatening to end the season as a .300+ hitter and a Gold Glove winner. Zito is getting calculated, intentional hits: well-executed bunts, infield hits and even a base hit swinging that looked great. Bay City Ball has a great piece about where Barry Zito’s hits go. Hint: the same way all the time. Nick Noonan continues to show presence that’s unusual for a rookie – key pinch hits, solid infield work. Brandon Belt has been streaky, still looking for his swing. The negative comments on a hole in his swing get ugly. I still have faith. This was a good series against a weak opponent that featured pitching and just enough hits by the Giants. Tim Lincecum mowed down the Padres through six and 2/3, striking out eight, looking very much like the Cy Young Award winning Timmy. Bochy was crisp with his leash in a 2-0 ballgame, pulling Tim with two out and two on in the sixth. Mijares got the last out on a deep pop fly to left, and he and Santiago Casilla set up Sergio Romo, who picked up his Major-League leading eighth save (8-1). The only runs in the game were the result of a 2-run homer by Pablo Sandoval that just got out of the park. The formula is simple and when applied effectively, beautiful. Tonight the formula was executed to perfection. An excellent game in which everything came together to end in a walkoff double by Angel Pagan and the Giants win 3-2. Buster Posey had a deep double, which hopefully will help him up out of his slump. Bochy pulled Bumgarner in the 6th, middle and late relief did their job, and Santiago Casilla got the win. Pablo Sandoval and Brandon Crawford, sadly, had their 11-game hit streaks ended, but this one was Giants Baseball all the way. The Brewers swept the Giants out of Milwaukee with home runs. The discrepency on the road trip was 15-2. That’s fifteen home runs by the Brewers and Cubs to two (Pence, Crawford) by the Giants on this road trip to Chicago and Milwaukee – and both Giants homers were in garbage time or playing long catch-up. Matt Cain and Barry Zito got blasted and the team ERA of the starting pitchers for the Giants exploded. It’s so early in the season that it isn’t that worrying, but that said, starting pitching – which was our centerpiece, our greatest strength – is suffering profound lapses of quality in recent days. Andrew Baggarly, Kruk and Kuip ask what’s up. It’s crazy to me that our greatest weakness right now is starting pitching! I am reminded of the Phillies vaunted staff Halladay, Lee, Oswalt, and Hamels (that we beat in 2010) who struggled as they got older, too. But they were in their 30’s. Our eldest guys, Matt and Tim, aren’t 30 yet. It is good news that other aspects of the team – bullpen, hitting, defense – are really pretty tight for April. Not a lot of errors. Giants showing fight and effort every night. The Brewers hit well in their park and basically broke open two of the three games early, making it exceedingly difficult to catch up, which emphasizes what we have been saying – we have to pull these pitchers earlier; it changes up the game. Ugh. Not a good series. Even Vogelsong who pitched well, got beat. The relievers getting innings is one upside to a series like this and Kontos, Casilla, Lopez and Mijares got minutes in the absence of Jeremy Affeldt. Mijares could grow into a middle reliever in his absence. Kontos and Casilla looked good, except poor Santiago got set up for the loss last night and allowed the single that ended the game. Rough situation to walk into: down 7 or down 8 or 9 … let’s see what happens with the bullpen at home. Brandon Crawford, Brandon Crawford, Brandon Crawford – another homer, lots of hits and moving all around the order now – Brandon is looking great. Everybody, even The Big Kahuna, is talking about his WAR. Unfortunately he did have another error which was quite costly, but his work at the plate and in the field continues to impress and that was an anomaly. Crawford and Sandoval have 10 game hitting streaks coming into the home stand against the Padres this weekend. Hunter Pence and Pagan are hitting well. Blanco is hot and cold after a day of horribly bad luck on Tuesday in Milwaukee. Torres, after impressing initially has cooled some. Nick Noonan is a gamer. Though he struggled against Milwaukee, he continues to show big-league ability at the plate. Not much else to say you can’t read elsewhere so I will wrap it up. Game Two was well-played and much more like a normal Giant game – a close, low-scoring, pitchers duel – and sadly, one in which we couldn’t score enough runs to get the win. The Giants left five on base and Pagan, Belt and Crawford, failed to bring runs in with Runners in Scoring Position with two outs: better than recently, but in a tight game, too important to neglect. Vogelsong looked good, hit his spots for the most part, and while Kyle Lohse dominated the Giants the first time through and had a no-hit, near perfect game going through 5, the whole order made adjustments to make it a game. The Brewers won on a 9th inning bases-loaded single off Casilla. Brandon Crawford continues to bat well, which is a great bonus thus far this year. I would love to see him hit .300 and win a Gold Glove. He and Sandoval have 10-game hit streaks now. Hunter Pence drove in two runs to give him 10RBI for the season – he’s batting .262. Santiago Casilla has played more ball than most, having anchored the World Baseball Classic Championship team from the Dominican Republic and while he has had great outings, like last week against the Cubs, last night’s was shaky at best. He was behind in the count a lot and Bochy left him in way too long, given his performance. I approve of working middle and late relief, but in a tight game, Bochy has to be more responsive, quicker on the trigger. Today’s a day game, so I’m off to set up the gear in the corner. Pablo Sandoval had four RBI. Nick Noonan had another clutch pinch hit. Brandon Crawford was brilliant in the field and great at the plate. but it just wasn’t enough to make up for Barry Zito getting shellacked for eight runs in the third, including a grand slam home run by Betancourt. Still, a lot of fight in these Giants, they nearly pulled it off. As we slowly put Giants Baseball Corner together, the Giants are in chilly Milwaukee to play the Brewers tonight with Barry Zito on the mound. If Zito starts with 3 shutout innings, he will be only the third Giant since 1900 to open a season with 17 shutout innings in a row (Worthington ’53, McCormick ’61). and the Giants pointed out on twitter that the club record for starting pitcher’s win streak is Carl Hubbell, 22-consecutive regular season starts from 1936-37. Zito has 13 – and 16 if you include the post-season of last year. Will probably upload a new post after the game tonight with video. We’re just fans listening to the Giants on the radio in a little corner in our house. Last Game vs. Chicago – Go Timmy! This is us celebrating too soon. So Sergio, it was our fault. Ours and the windy city’s..
“Including last year’s postseason, the Giants are riding a streak of 16 straight victories with Barry Zito on the mound. The left-hander pitched seven scoreless innings and went 2-for-3 with two runs scored Wednesday in a 10-0 drubbing of the Rockies. Zito posted a 1.69 ERA in his three postseason starts last year, and he’s yet to allow a run in 14 innings in 2013. We’ve been discussing Zito’s option in local press for a week, including CA Sportswriter of the Year Tim Kawakami’s piece and this guy claims, “perhaps no one but me is thinking of next year right now” wow. 7/18 with RISP still isn’t 50% of the time, but it’s a damn sight better than 0 for 7. Game One homers by Pence and Panda and Game Three situational hitting resulted in big wins for the Giants, but Game Two was perhaps the best victory. With Tim Lincecum on the mound, The Giants fells behind early and were down 6 – 2 before rallying to win it behind Brandon Crawford’s opposite field three-run homer followed by excellent situational hitting from Scutaro and Pence – who tied the game with a bunt to advance the runner and an RBI single, respectively. Andres Torres pinch-hit to get aboard and Angel Pagan drove in the winning run. It was great to see the Giants make the comeback and to win with good hitting. The 10-0 blowout was all about Barry Zito – who has been sensational on the mound since August of last year. But he was also 2-3 at the plate. What if he keeps this up? Could the guy bat .200+? Continue getting shutouts, wins and hit? Let’s hope so because it has been a joy to watch and the feeling of redemption every time is epic. Way to go Barry – everybody’s talking about how you have more hits than Heyward and they haven’t even noticed the scoreless inning streak! Santiago Casilla had a very rough outing in the Opening Series in Los Angeles, after being a key member of the bullpen for the World Baseball Classic Championship Team from the Dominican Republic. He had a wild pitch that scored a run in LA and looked generally uncomfortable. Not so Tuesday as Casilla pitched a scoreless 8th inning to set up Sergio Romo, who struck out two in the 9th inning to pick up his fifth save. Javier Lopez and Chad Gaudin had 3-up, 3-down innings in relief of Zito, with each recording a strikeout. Zito’s on the mound, it’s in the high 70’s at AT&T Park. Barry retired Colorado with a strikeout but issued a walk – a source of concern for anyone who has ever followed Zito’s career. Pagan just singled to lead off the bottom of the first. 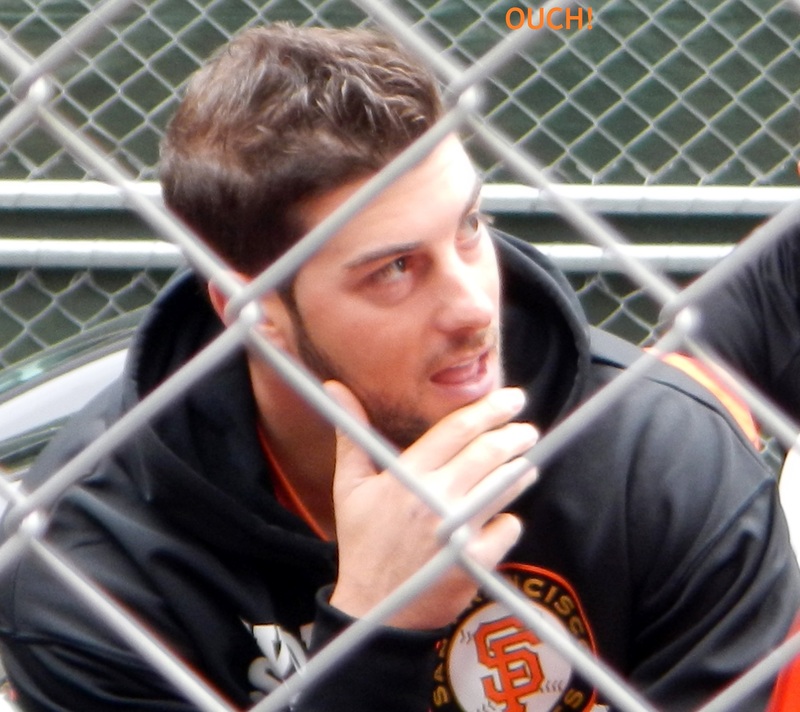 Scutaro …. and a stand up triple for Posey! Not much time to write before we play again, but just to take note of Hunter Pence’s Big Fly – which I understand was deep to left-center. I hope we see more of that this year. If we could get Hunter batting .300 along with Panda, Posey and Pagan; get Crawford up to .270 and get some timely hits from Blanco we should win the division outright. Another strong outing from Madison Bumgarner whose mastery of the Rockies continues. Here’s hoping Timmy keeps it rolling tonight with a little better command and less walks. Sergio Romo tweeted that his goal was 50 saves and he is well on his way with four in as many appearances. Rock on Sergio! That’s What’s Up! Sunday’s fiasco of onfield baseball effort by the Giants on ring ceremony day was frustrating for many reasons for fans who, like me, prefer playing baseball to celebrating victory. Giants Baseball Corner proposes a different view of our Giants than that promoted relentlessly by Comcast – the broadcaster I hold principally responsible for the excessive in-season ceremonies and schmaltzy, non-baseball content with which fans now waste their time. I don’t mean to sound like a crank – but the soccer-momming of baseball makes it less enjoyable to me, and I think to some other fans as well, I’d rather be talking about squeeze plays than surfing Deloreans, rather be talking strengths and weaknesses of opposing pitchers than of the outfits on fans at the stadium. But the entertainment industry is wired differently – it’s why listening to FOX Sports during the World Series is almost unbearable. All of this has emerged from the success of the team as we have at last become World Series Champions, but instead of adding to the value of those victories, Comcast and these overproduced ceremonies make us look kitschy, immodest and less classy. It makes us look like a superficial, self-centered team that couldn’t care less about anyone else – an arrogance of 49er fans that was never a part of being a Giant. The St. Louis Cardinals must have been boiling in their dugout as we partied and gushed, bloviated and gave out bling. The Cardinals began their season on the road with back-to-back series against Western Division foes. They split these to start the season .500 when they go back at home for their own opener. They showed real fight in the Sunday night game last week, the Diamondbacks season opening series, which ended in a scrappy, 16-inning fight in which the Snakes came back not once but twice to force extra innings and finally win it late at night. Coming off that loss and forced to watch the Giants long-running designed-for-television celebrations, the Cards came ready to play and to make a mockery of our effort. The series with the Giants clarified the difference in attitude between the two teams at the moment of the contest. The Giants managed one run in their victory by virtue of a bases-loaded walk, stranded double-digit runners in scoring position and melted down in the face of hard effort by a Cards team that wanted to win. They looked more focused and hungrier. We looked satisfied and uncaring. Result: Cards win 2-1 with a crushing 14-3 explosion in our “pitchers park” to back their high-paid ace Adam Wainwright while we watched our Big Horse melt down the second time through their order – they’d figured him out. I am not against celebrating – I just wish we could do all our celebrating in off-season and let the regular season be for playing baseball. In baseball terms, exactly as exciting and thrilling as the opening series on the road against the Dodgers was, the home opener and the opening series at AT&T Park was miserable. Comcast better quit celebrating and let the G-men get going. They aren’t just going to give us the third one. The National League Championship Series last year was between the winners of the two previous World Series and both teams relied heavily on defense – and in particular, pitching. Relief pitching. Specialist pitching. Pitching. In the offseason, Adam Wainwright signed a deal like what we gave Matt Cain in 2011, guaranteeing he’ll retire a Card. He’s their Big Horse. The Cards have been on the road to start the season and lost a 16 inning outing Sunday in Arizona to go under .500. So the Giants are facing the St, Louis Cardinals’ ace with their back against the wall to return home for their opener even. Matt Cain was saved the enduring embarrassment of a loss because the Giants can’t provide him run support for the umpteenth time in six years, because George Kontos took the loss on the freak swing by Kershaw. That said, Matt Cain needs a Home Win, Dammit. The rubber match should be a very good one, and I expect this one to have more runs. Cain will scatter 4 runs across 7 innings, so WE HAVE TO TAG WAINWRIGHT. Giants 9 – 4 is what I want to see. Cain goes 1 – 0. Brandon Belt, we need some offense. It took a perfect outing from one of the best lefties in baseball – including the first home run he ever hit in his life – to mar what was otherwise an excellent opening series for the San Francisco Giants. The Giants looked crisp off the mound and decent at the plate, hitting in rotation situationally and even manufacturing runs. The biggest issue at the plate is we are once again on pace to lead the league in hitting into double plays! But it’s early and that stuff will hopefully start to winnow out. Pitching – particularly Cain, Bumgarner and Romo – was stellar. The Giants won the series 2-1 over their NL West division rivals the Los Angeles Dodgers to take an early season lead in what will likely be a fight for first place in the division with Arizona. The Diamondbacks made a statement in last night’s game – a scrappy, hard-fought, come-from-behind, 16-inning win over the St. Louis Cardinals to start their season 2-1 as well. Starting pitchers did not allow a single earned run. Cain was, typically, Big Horse consistent and stable. Bumgarner was intensely precise and Lincecum used balls and walks liberally, but stayed on top of his game. Madison Bumgarner’s performance was platinum. He had tight, controlled movement and dominated the Dodger lineup. It was great to see from the young, powerful Big Country Mad Bum. Bruce Bochy showed smart sensitivity pulling Cain in the first game. Cain and Lincecum are the eldest on our very young staff, and both got pulled before the 7th. This is how to develop middle and late relief and to protect starters’ arms over the long season. Over the course of the last two years Bochy has slowly shown an increasing willingness to use the bullpen rather than risk fatigue – either of arms in the long term or of minds on the mound in the short term – with our starting pitching. This has culminated in the masterful use of a committee of late relief and closers last year down the stretch. It’s important because our most significant problem (as pointed out most clearly by Bay City Ball) is depth at Starting Pitching. If one of our big 5 goes down, we’d have to adapt fast. shake it off homes. freak swing by the opposing pitcher. Before that Kontos had an excellent 7th inning and looked ready to work the middle and pass the ball over to one of our capable lefties before Romo. It was a shame it shook out like that. We believe in you George, it was a solid outing before the guy decided he wanted to make history in LA. In a way George, we needed you to take that hit because a LOT of us really don’t want Matt Cain getting any more losses in tight games than he has to. The poor guy has suffered his entire career with win-loss records beleaguered by our inability to produce runs. You took those runs that night so Matty wouldn’t get them and the loss and we appreciate it. Casilla’s wild pitch, Lincecum’s, others’ can be chalked up to the season being very young and we should be honest and expect more sloppy working it out in the first month or so. In Casilla’s case especially, the guy is coming off winning the World Baseball Championship – The Dominicans ran the table! and he was overwrought and excellent in relief. (Haft has details on Casilla’s effort). The guy has played more ball under pressure than most this year – Casilla gets a one month pass. Casilla’sWP:coming off winning the WBC,beating PR to do it,more ball under pressure than most this year – Casilla gets a one month pass. Sergio Romo was SOLID GOLD. and he tweeted throughout including one which read that his “goal” was 50 saves! That was exciting to read. I hope you make it my man … That’s What’s Up! Situational hitting and manufacturing runs was the story of the offense and this continued to game three when Crawford and Pagan joined in on the action. But the team added homers by Pablo and Pence! Thrilling stuff to see the offense coming together – power, contact, base-running (I’m excluding el caballero loco on that last one). Pagan leading off, Scutaro, Pablo and Posey behind him is going to work well. The problem remains that too often the Giants destroyed opportunities by hitting into double plays. It is the beginning of the season and on any other team I wouldn’t bat an eye, but we have a historic problem that reaches back several years in this regard. Maybe bunt practice in order to take advantage of squeeze chances would help in other situations as well. If we aren’t going get a lot of hits, or score a lot of runs we have to at least keep runners on the paths and continue to manufacture runs as we have been doing the last year and change. With Brandon Belt falling sick, Bochy had a chance to do more moving of the chess pieces. Arias on first and Sanchez behind the plate yielded and didn’t, had succeses and problems, but more I was happy to see this kind of constant moving about of players. I am of the mind we need a flexible team offensive scheme. Blanco or Torres in LF. It’s flex-offense. I love Bochy for this team approach and have no problem with half a season going by with pieces moving in concert or individually to suit opponent, weather, interleague and etc. I have come around on this. Used to chew my nails to shreds over Bochy’s calls, now I see a logic in it. We can recreate units to suit. Cool. IMPORTANT NOTE: Brandon Crawford also known as @bcraw35 continues to rock short. Golden Glove campaign [BCrawGG13] required. Hunter Pence still looks like a crazy-eyed wild man going after balls. I trust him … and yet … it makes me nuts to see Pence and Pagan still doing the chipmunk act from the old Looney Tunes cartoons .. “After you.” “No, After You. “No I insist.” (ball drops to the field). I know Pence has only been out there a few months for us, but he and Pagan have to work that out because problems we saw last year continue. Pagan manhandled CF again. LF hardly saw any action at all so the platoon was untested. All told an excellent series for the Giants and a great way to launch Giants Baseball Corner. I will be posting Series Wrap-ups like this whether I post full series game for game or not. Feel free to comment, feedback etc. best is on TWITTER, in my opinion. Sorry to everybody but particularly to Julian for over tweeting while getting GBC set up. All are welcome here where we are focused on the relentless flow of the positive river.